Courses vary from a 20 hours course Monday to Thursday and a weekend course of 12 hours Saturday to Sunday. Also a course of 30 sessions of 3 hours which can be taken at any time during the week or weekend. Courses run thoughout the year and you are able to choose the formula which suits you best. Depending upon whether courses are full,you are able to choose sessions to suit your availability. To maintain a high level of course delivery we enroll a maximum number of 8 participants per course. 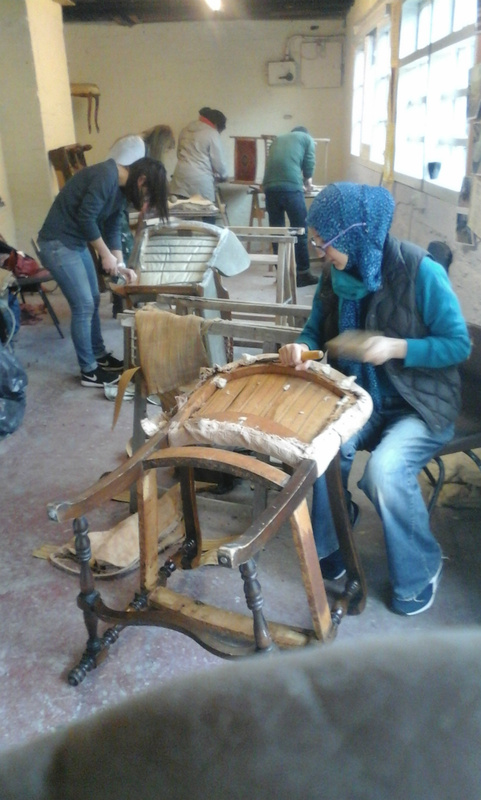 Places are filled rapidly so please do not hesitate to contact us for information.Speak to Garry on 07938 501186 Course fees include the use of tools, basic materiels such as hessian, webbing, twines, etc. and of course tea and coffee which are essential for a harmonious workshop. Other materiels required to complete a project will be charged as the project advances. Depending on the course you wish to attend payment can be made by instalments. If payment is made by cheque, attendance will only be confirmed once cleared funds have been recieved. Reimbursement of fees will be considered on an individual basis. All couses booked will be considered as being attended if 48 hours notice of cancellation is not given. Bookings can be made by sending an email via the Contact Us page clearly stating your name and contact information . Payments can be made by cheque or by direct credit transfer. Please ask for our bank details for this to be facilitated. If you hold a gift voucher, this should be redeemed with your enrollment form which clearly indicates which course you wish to undertake.